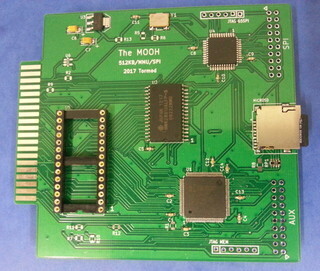 The MOOH is a memory expansion cartridge board for the Dragon 32/64 and CoCo 1/2, adding 512 KB of RAM and a socket for up to 64 KB ROM. It also features an SPI interface and an SD-card slot. The board is currently being made in smaller batches, so there can be some weeks of delivery time. (No payment is taken before the boards are ready to ship). 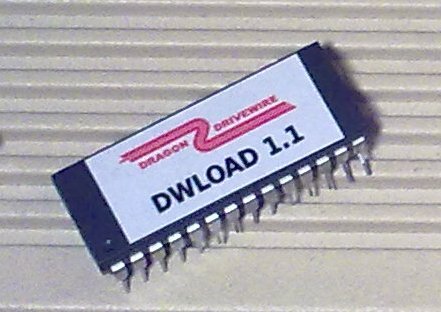 The board is designed to allow Dragon and CoCo 1/2 computers to run multitasking operating system such as NitrOS-9 Level-2 and FUZIX, offering virtual address spaces for each process, as well as fast mass storage on SD cards. Other SPI devices can also be connected. The ROM socket acts like a standard cartridge ROM, additionally offering software selection of multiple ROM images. A boot ROM allows the MOOH to be used without the need for any other storage devices or MPI. The "SDBOOT" ROM loads a program or operating system from the SD card on power-on. The board comes with a printed manual with programming details, schematics and internal logic code. NitrOS-9 is an advanced multi-tasking operating system for 6809-based system, with roots in the original OS-9 in the 1980's. OS-9 Level 2 was originally written for the Tandy CoCo 3 and to take advantage of its 128 KB (or 512 KB when upgraded) of RAM. An experimental port of NitrOS-9 Level 2 for the MOOH is available. Note that programs using the extended graphic modes of the CoCo 3 will not be able to run on your Dragon or CoCo 1/2. FUZIX is a UNIX-like operating system that currently is being developed for a range of 8-bit microcomputer systems from the 1980's. Dragon is a first class citizen in FUZIX land, and is in combination with the MOOH board an excellent platform for this exciting operating system. Your own machine language programs can access the 512 KB by mapping blocks of 8 KB into the CPU memory space. Potential applications include RAM disks and disk buffers. Please note that the MOOH board does not turn your CoCo 1 or CoCo 2 into a CoCo 3. In addition to the expanded memory unit, the CoCo 3 also has extended graphics modes and interrupt handling. Programs made for the CoCo 3 will not always run on the MOOH, especially those using graphics. 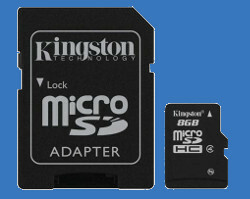 This is a standard 16 GB micro SDHC card from Kingston, prepared with example files and utilities to get you going. Includes micro-SD to SD card adapter. The SDBOOT loads a program or operating system from the SD card on power-on. Instructions on how to prepare SD cards for MOOH. Copyright 2017-2018 Tormod Volden. This page was originally generated by GitHub Pages based on the Cayman theme by Jason Long.